So the next question is what ambient noise level might we expect in a rural setting on 40m. ITU-R P.372-12 gives us guidance, suggesting the median ambient noise figure (NF) at 7MHz in a rural precinct is 44.6dB. This will dwarf the NF of a good HF receiver which will be better than 15dB without preamp, so we will run with total NF of 44.6dB. Let us now calculate the signal to noise ratio (S/N) in 2.5kHz noise bandwidth of the rx signal of -7.1dBµV/m with NF of 44.6dB. We will assume that the rx antenna is a 100% efficient QW vertical with directivity 3 (gain 4.77dBi). 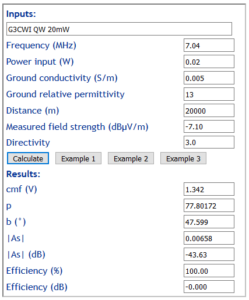 Again a handy online calculator can be used, Field strength / receive power converter. Above is the input data for the problem. 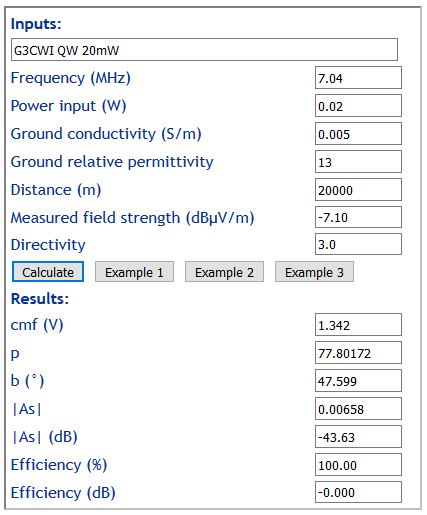 The use of 2500Hz noise bandwidth is to obtain results in terms of WSPR’s reference for S/N reports. Above the results contains at the end, the rx S/N which is 2.46dB. Because the external noise is much greater than the rx internal noise in this scenario, small reduction in rx antenna efficiency and gain will not significantly alter the rx S/N ratio, though it will reduce the received power. Rx ambient noise varies with location, time, polarisation, neighbourhood effects, atmospherics etc. The ambient noise scenario modelled here is for a rural precinct, and city noise could easily be 10dB or more worse. Rx ambient noise in this scenario dominates total noise, and any difference would roll directly into rx S/N. A further source of noise is unwanted signals. Because of the uncoordinated way in which WSPR works, there is a significant risk of interference from stations that might reduce the S/N ratio observed on the desired signal. 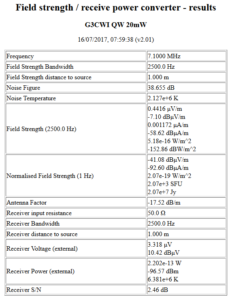 The tx antenna used for Richard’s experiment is likely to have an efficiency of perhaps -1dB give or take, and that would directly roll into observed rx S/N ratio. Soil is not homogenous, and ground type for Richard’s test is unknown. Soil type has a significant effect on path loss over such a long ground wave path, and that rolls directly into observed S/N ratio. Richard collected 169 paired observations of two transmitters received at one receiver 20km distant on 40m. 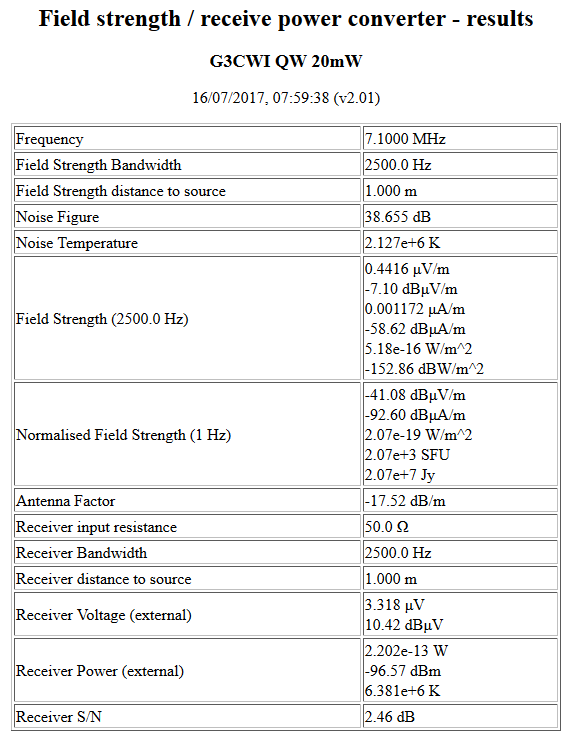 The observed median S/N ratio for the transmitter discussed in this article was 1dB, which is quite in keeping with the prediction of 2.5-1=1.5dB for a typical antenna over an ‘average ground’ path with typical rural ambient noise. There is a great deal of uncertainty in the estimate, and the largest element would be the soil type assumed, next would be the ambient noise at the receiver. Nevertheless, the article describes a process for estimating the performance and the estimate is improved by better knowledge of all the influencing parameters. Norton, KA. Dec 1941. The calculation of ground wave field intensity over a finite conducting spherical earth. Proc IRE, vol 29, pp 623-639. ———. Oct 1936. The propagation of radio waves over the surface of the earth and in the upper atmosphere Part I. Proc IRE, vol 24, pp 1367-1387. ———. Sep 1937. The propagation of radio waves over the surface of the earth and in the upper atmosphere Part II. Proc IRE, vol 25, pp 1203-1236.